In a large skillet, heat olive oil. Saute' garlic, onion, celery, and green pepper for 3 minutes. Add water, chicken broth, and rice, stirring occasionally for a few minutes (until rice just starts to absorb water). Add black eye peas, ham or bacon, and pepper. Simmer for 5 minutes and serve. If you'd like a printer-friendly version of this recipe, Click Here. Need a dinner idea? Here's one -- read through "Points in My Life" more often. :) But until you have time to sit down with nice drink and go through this entire blog, here is a quick and easy dinner idea for you now. Enjoy! Cook ground turkey, onion, and garlic in skillet until meat is browned. Drain grease. Add seasonings and tomato soup and simmer on low for 3 minutes. Add cheese and veggies (if desired), stirring occasionally until cheese is melted. Cut off tops of peppers and scoop out the insides with a spoon. Cook peppers in boiling water for 3 to 5 minutes (or until barely tender but not mushy.) 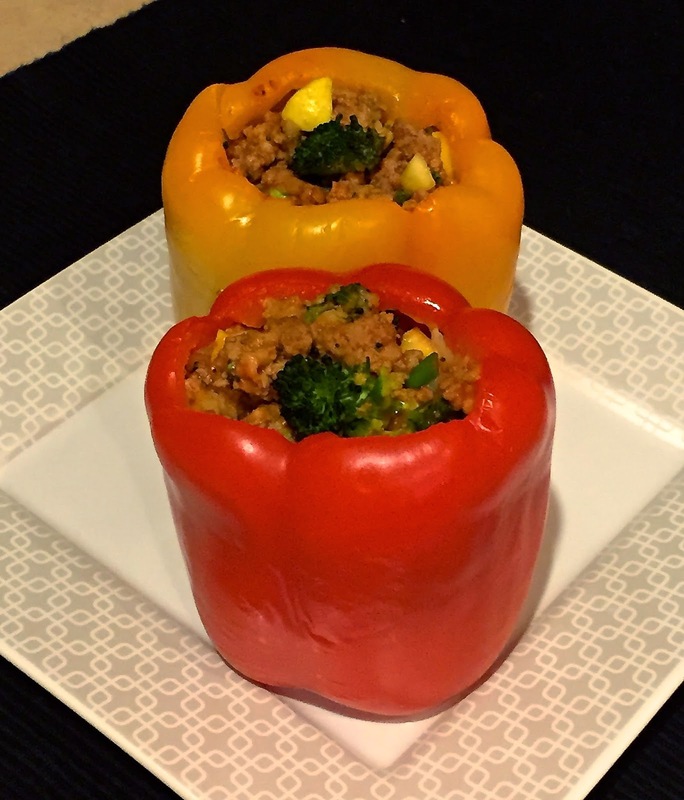 Scoop ground turkey mixture into peppers and serve. (Sprinkle a little cheese on top if desired.) If you'd like a printer-friendly version of this recipe, Click Here. Note: Enjoy my low-point veggie salad as a side item. "What you be tomorrow, depends on the choices you make today." 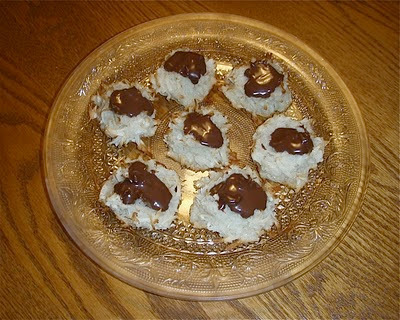 Coconut lovers can stop searching the internet for a wonderful coconut cookie recipe, because you just found it! :) These terrific coconut macaroons have a great taste and with just a touch of chocolate, there's extra goodness in every bite! Preheat oven to 350 degrees. Line a large cookie sheets with parchment paper. In a large bowl, whisk egg whites and sugar (or place in mixer and mix on medium speed for a few minutes). Add vanilla and coconut. Stir to combine. Scoop up a heaping tablespoon of batter and form into a little ball or pile into your hands. Place the ball or little pile of coconut mixture on cookie sheet. Bake until the tops start turning light tan (about 15 minutes). Remove cookies to cooling rack for about 30 minutes. Melt chocolate in a double boiler (or in the microwave) and place a little bit in the center of each cookie. Freeze until chocolate sets, about 20 or 30 minutes. If you'd like a printer-friendly version of this recipe, Click Here. Note: These cookies were a made a little larger than the recipe called. If you made them a little smaller and made 18 total, the total points per serving would be 2.3. You may not have time to prepare this wonderful appetizer recipe for Christmas, but let's not forget about New Year's Eve! :) Ring in the new year with this fantastic crab-stuffed pea pod appetizer. Cut seam on side of pea pod forming pocket. Combine all ingredients in a small bowl. Spoon or pipe crab mixture into each pod. Cover and refrigerate at least one hour. If you'd like a printer-friendly version of this recipe, Click Here. Mix well and form into little balls. Place on ungreased cookie sheet and flatten with a fork. Bake at 375 degrees for 8 1/2 to 9 minutes. Sift powdered sugar on top after baking for a little added sweetness. If you'd like a printer-friendly version of this recipe, Click Here. During this time of year, a lot of people prefer to save their "points" or higher-calorie foods for divine holiday desserts. If you're one of these people, make sure your low-calorie lunch or supper is healthy! This very healthy low-point Garbanzo salad has a delicious flavor and light enough to fill up on so you won't go overboard this season on the sweets. Mix all ingredients and serve! How easy is that? :) If you'd like a printer-friendly version of this recipe, Click Here. *Tip: You can make this salad 3 pts. for 1 cup by using 12 black olives (chopped) instead of 24 and also by leaving out the 2 oz. of Feta cheese and just adding 1 Tbs of it to your portion after you put it on your plate. With the Christmas season upon us, you're probably looking for a lot of holiday dessert recipes that will delight your guests and satisfy your holiday cravings. This "Points in My Life" blog contains a lot of delicious dessert recipes; however, you're not supposed to have dessert until after you eat your supper! 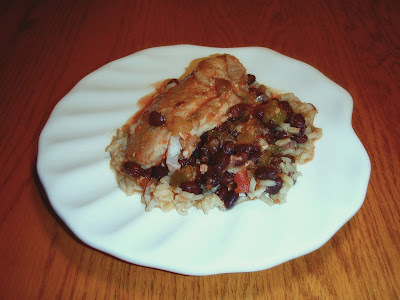 :) Here is a very enjoyable crock pot recipe that only contains four ingredients. Easy, low-point, and delicious...all the criteria you need to lick your plate clean! A few people have asked if I have any cookie recipes for diabetics. That, I do! :) I have made these chocolate chip cookies for several of my friends who are diabetic and they enjoy them very much. The only problem is, so do we! Therefore, after I bake them I have to quickly move them to a tray and mark them as "cookies to be given away." If you know of anyone you would like to share this recipe with or bake these cookies for, they're incredibly easy to make and very delicious to eat. Combine butter, sugars, egg, and vanilla. Add flour, baking soda, and milk. Mix well. Blend in the chopped chocolates. Drop by spoonfuls on cookie sheet and bake at 375 for 8 or 9 minutes. If you'd like a printer-friendly version of this recipe, Click Here. If you're Polish, you're probably very familiar with these delicious "Kolocky" cookies. If you're not Polish, you're probably very familiar with these delicious "Thumbprint" cookies! :) Either way, these cookies are very simple to make, very low-point, and the type of cookie you can make as "sweet" as you desire. - Any flavor fruit spread (A sugar free Red Raspberry fruit spread was used for this batch). Mix butter, flour, and cream cheese in a mixer. Roll out on flour board, thinner than cutout cookies, thicker than paper. Cut out little circles and place on cookie sheet. Make a small indent in the center and add a small teaspoon of any flavor fruit spread in the center. Bake at 350 degrees for 10 to 12 minutes or until the bottom is light golden. Sprinkle with a little powdered sugar if you desire a little more sweetness. If you'd like a printer-friendly version of this recipe, Click Here. It's that time of year, bringing Christmas cheer, for goodness sakes it's time to bake, so great recipes can be found right here. :) Ok maybe that's not how the song goes but it's still a catchy tune. These melt-in-your-mouth cookies will be the hit of any holiday party! Mix butter, powdered sugar, and vanilla. Combine flour and salt and add to cream mixture. Stir in pecans. Roll into balls and bake on ungreased baking sheet for 12 minutes at 350 degrees. Cool slightly and roll in powdered sugar. If you'd like a printer-friendly version of this recipe, Click Here.